Q: How long is the life of a certain Fedora release? Q: When the Fedora Webcomic started? A: Roughly 13 months ago. Q: Do you get where I am going with this? Q: So will it disappear from the face of the web? A: No, it will remain archived, together with the SVG sources at its canonical location. It was a hard decision, as I had a lot of fun working on it and it was a fruit of passion, but the decision was taken long time ago (October-November) and the final graphic was implemented back on February: the writing was on the wall for quite some time. I continued it for months mainly due to my stubborness and waited for a milestone and a credible(?) excuse to get out. Good thing I didn't set any performance metric for the comic, otherwise I would have been sad about it not meeting any of the expectations... So not having enough data, I can't make any conclusion: it failed due my poor implementation (graphics, stories) or due to my decision to address such a narrow niche (Fedora and Fedora on the desktop). But I have enough data (comments, traffic, link backs, translations) to conclude it was a failure. 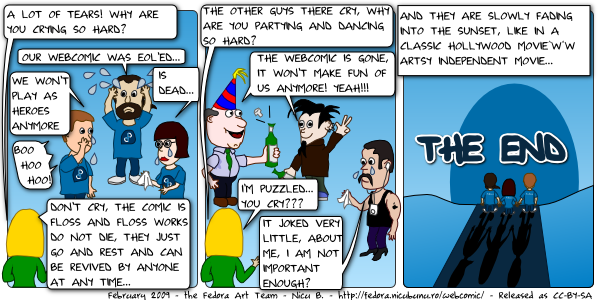 Thanks Nicu for the 13 months of Fedora Webcomic! Well, I've never been a huge fan of the comic but I've always read and often enjoyed it. Not sure if you made your conclusion based on the right sort of data, tho. I've been a fan since the begining. I read it everytime, your comics are great! That was one of the most fun things I read in the Fedora planet. I was always waiting for a new strip to come out! Are you sure you used the right data for your conclusion? It was like a bright spot in the dark shadow cast by the frustration of bug reports, complaints about everyday life and other insignifiant content on NABPS! It was like being able to watch colour TV in a village where everyone else only had B/W! Just to let you know.. I kinda enjoyed your comic. I'm not a Fedora contributor (in code, I mean), but I follow the planet. Thanks for your efforts. And all the very best for future endeavours. The problem with your comic is that it was too emphatically, too boldly, too exaggeratedly pro-Fedora, pro-Linux, etc. I don't say it shouldn't have been pro these ideas. What I am saying is that it resembled too much with “Cântarea României”, “Omagiu Conducătorului Iubit”, or with “Comrade Stalin is the Friend of all the peoples”. Oh dear... It actually had fairly good jokes by my standard. I just checked the date today. I guess it is the end then. I enjoyed it and am sad it's gone ... but thank you for continuing it as long as you did! Wait, shouldn't there be a version 3.0 first?